Forms and exercises from 5 section taijiquan (wuduan taijiquan in Chinese) have been adopted by taiji schools around the world. The program has been designed to meet the needs of contemporary recreational taiji groups and to prepare committed students for traditional taijiquan training. 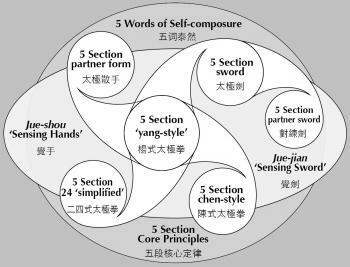 This wuduan taijiquan overview diagram provides an at-a-glance view of the 5 section program, depicting it's three-layered structure and sketching-out the connection between all of the forms and practices. By illustrating the jig-saw relationships of the component parts, the graphic can be used as an aid in curriculum creation, suggesting optimal paths for individuals and groups in different circumstances. When encouraged to take an active hand in devising their own path of growth practitioners can respectfully balance present-day attitudes with the traditional art. 1. As material for stand-alone recreational taiji programs. 2. As preparation for the study of traditional taijiquan styles. 3. As a reserve of material to supplement programs lacking in curriculum. • Jue-shou 五段覺手 (sensing-hands). Multi-functional partner work which supports solo and partner form studies. 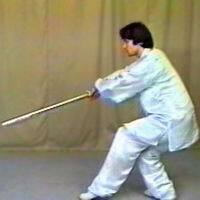 • Jue-jian 五段覺劍 (sensing-sword). Multi-functional partner work which supports solo and partner sword form studies. What does 'wuduan' taijiquan mean? Wuduan (五段) is Chinese and means literally 'five sections' referring to the five movement passages that exist within each of the 5 section taijiquan forms. The sections follow this general format: advancing, retreating, movement to the side, movements of balance and extension, fixing the centre. Is 5 section taijiquan a martial art? Not exactly. Although all taijiquan is based on the traditions of Chinese wushu (martial arts), martial application and strategy are only suggested in the wuduan program. It is true however, that practitioners well trained in 5 section forms, connection work and principles training are well prepared for the rigorous intensity of traditional taijiquan training which is in its essence a martial art. 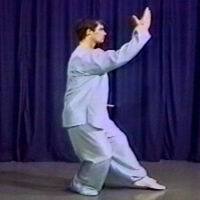 In martial arts terms one can think of wuduan taijiquan as an accelerated early or pre-training program. Is this kind of taiji only for beginners? The wuduan forms, which span beginner, intermediate and moderately advanced levels, are well suited to meet the needs of modern recreational taiji learners. Beginning students who want to get a feel for what taiji is about can acquire the basics and have a practice to enjoy for the rest of their lives. More serious students can prepare for advanced traditional taijiquan training with the 5 section program as well. Many cases have shown 5 section trained taiji players to have better ability and understanding of the art than traditionally schooled students who must spend a long time gaining basic level skills. Mastering the basics through the wuduan program can accelerate overall taiji development by many years. Are there belts or levels in wuduan taijiquan? No. Some schools of Chinese wushu use belt ranking systems but this is mostly a characteristic of the martial arts of other asian countries. There are no formal certifications for skill level within 5 section taijiquan although it is possible to take teacher's training courses and be recognized as an instructor. What is 'Simplified 24 Taijiquan'? In the 1950's a set of initiatives were introduced by the Chinese government designed to help promote and develop physical fitness through Chinese martial art culture. The Simplified 24 Movement Taijiquan (二十四式太極拳) was issued in 1956 after a committee of experts choreographed some of the most popular sequences from the traditional yang style long form. The 'Beijing 24' is now practiced around the world. 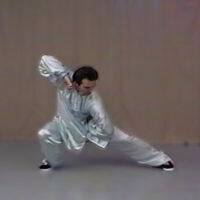 The 5 section taijiquan solo yang-style form is a further simplification of the 24 which itself possesses several intermediate level movements too difficult for most beginners. Within the context of the 5 section taijiquan program the 24 simplified form is something to aspire toward and conforms to principles mastered while learning the 5 section solo yang routine. Why is partner work important in taiji? Taijiquan, in its essence, is a partner activity. Traditionally speaking, solo forms and exercises are meant to prepare for two person work. While practitioners can learn and experience many positive results from solo work, far greater benefit comes from applying principles while in physical contact with another taiji player. It can fairly be said that without partner connection the essence of taiji is missing. For various reasons partner work does not appeal to everyone and many enthusiasts have had unhappy experiences with taiji push-hands or martial applications work. The purpose of wuduan jue-shou or 'sensing-hands' is to open up a tactile dialogue which includes communication through touch, transformation of energy and movement through relaxation. By focusing attention on the basics of making and maintaining partner connection (rather than on competitive outcomes), jue-shou can help practitioners to transform what they have learned through solo work into a meaningful understanding of the art of taijiquan. Sensing-hands, as adopted by the 5 section program, is in fact authentic preparation for traditional taiji partner work.